It is almost impossible to get some exercise in this town. Even if you truly want to, there is always an enticing lazy solution lurking around the corner just begging you to take the easy way out . The groceries and meds were delivered within half an hour of ordering them. The tailor came over, took my measurements and promised to return my pants the next day. The salon sent the beautician to do my nails while my baby napped. At least I had to physically move and go to Studio Fitness to exercise. But just then I checked my email to find an in-home personal trainer offer from Groupon. And you know which option I picked! My list was done and I felt I didn’t actually do any work. So, I decided to make some chocolate macarons.Even though they are pretty easy to make, with all the steps and fiddling they are rather labour intensive. So, I jumped at the opportunity since I figured this was the only workout I was going to get today! P.S. Since this is Dubai and there is always an easier option available, rather than making these macarons yourself you can just catch me at Bakefest Dxb on November 26 at Wild Peeta and eat them there!! 1. To make the cookies for the chocolate macaroons, position a rack in the middle of the oven and preheat the oven to 400°F (200°C). Line 2 large baking sheets with parchment paper. 4. Transfer the batter to a pastry bag fitted with a 1/2-inch plain tip. Pipe out 1-inch-diameter mounds about 2 inches apart on the prepared baking sheets. Bake, one sheet at a time, for 6 to 8 minutes, until the tops are cracked and appear dry but the macaroons are still slightly soft to the touch. This entry was posted in Desserts, Vegetarian and tagged Bakefest DXB, Chocolate Macaroons, Macarons au Chocolat by thepantrydiva. Bookmark the permalink. After eating these today… I can say they're really good!!! Wow! 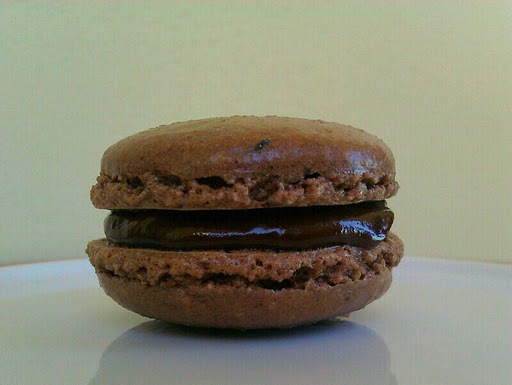 I tried these at bakefest and honestly…these are the BEST chocolate macarons I've had, EVER. I kid you not, they're crazy good.